For whatever reason, the health virtues of rye have been popping up left and right in my reading material recently. That prompted me to pick up some dark rye flour from Bob’s Red Mill the last time we were in Portland. On the drive home I was contemplating how I could use the flour in a meal and I started thinking about what I used to love rye with. The Reuben sandwich was the hands down winner. So how could I transform this sandwich classic into an alternative meal? With a smile on my face it occurred to me that I could make a dark rye pasta with caraway seeds…and the daydreaming just went on from there. This is a wonderful sauce that can also be used as a salad dressing or sandwich spread when cooled. Sauté the onions in a small drizzle of olive oil until softened. Add the tomato paste and spread onto the bottom of the pan to caramelize. Add the stock and whisk gently until the tomato paste is incorporated into the sauce. Add the worcestershire sauce and chili garlic paste. Mix well. In a food processor, pulse the tofu until creamed. Add a ladleful of the tomato sauce to the food processor and pulse. Transfer the contents to the pan on the stove containing the tomato sauce and mix until fully homogenous. Simmer over medium low heat for 15 minutes. Season with salt and pepper. Add the flours to a food processor. Drizzle in the olive oil and pulse. With the processor running, slowly drizzle in the water and continue to do so until the dough pulls off the sides and clings to the center “S”-blade. Remove the dough from the processor and place upon a flour coated surface. If the dough is too tacky then incorporate in more flour until it is no longer tacky to the touch. Knead the dough a dozen times or so and then shape into a flattened round. Wrap in plastic and set aside to rest for 15-30 minutes. Remove plastic and divide into two. Run through the largest setting on the pasta roller twice, then repeat two settings higher. Either cut with the fettuccine attachment or by hand into strips. When ready to cook, gently drop into salted boiling water and cook until the pasta comes to the surface. This should take between one and two minutes. Grind the whole spices in a spice grinder and then add the rest of the spices and sugar to the grinder and pulse to mix well. Transfer to a gallon-sized zip bag with 1/3 cup olive oil and mix well. Steam the tempeh for 15 minutes to remove its bitterness. Set aside to cool. Once cooled, add to the spiced oil in the gallon bag and even coat each piece, gently. If you need more volume to completely coat all the tempeh pieces, add more oil. Refrigerate as long as possible up to a few days. The longer the rub sits upon the tempeh, the deeper the flavors will penetrate. Gently flip the bag every few hours or so in order to evenly marinate the tempeh. Brush off any spice clumps that may have formed on the tempeh. If you do not do this they shall burn in the grill pan. Place the strips upon a heated grill pan and sear. Crumble into bite-sized pieces. 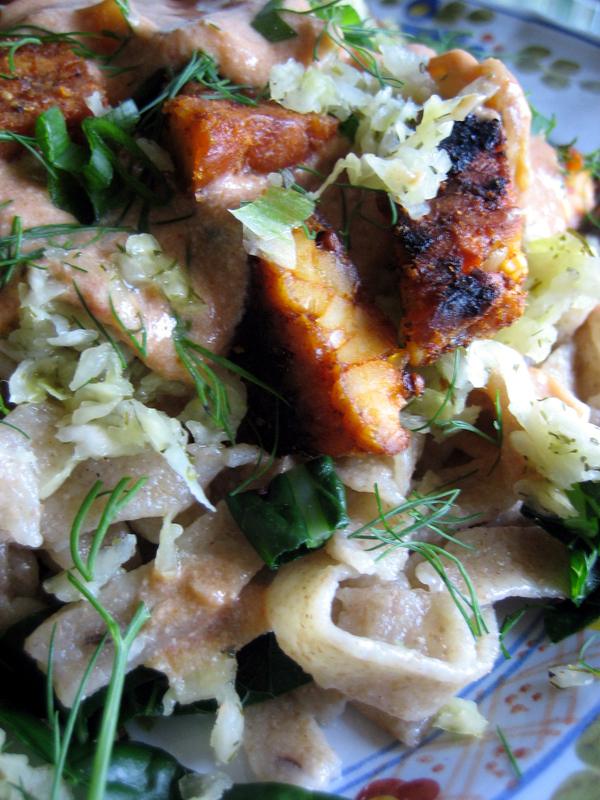 Place the cooked pasta on a plate and top with a generous amount of Russian dressing pasta sauce. Add a layer of tempeh pieces. Sprinkle with some sauerkraut, caraway seeds, sliced green onion and fresh dill. You’re very welcome Amanda. It was a really awesome meal. Now I must ask for a pasta roller for Christmas. Heh heh. You’ll love it. I picked up mine [it’s a manual one] for about 25 bucks. I also use it to make crackers of uniform thickness. Hi there! We just wanted to let you know this was featured on FoodPress.com today! A VERY intriguing recipe to say the least! 🙂 Thanks so much! That’s awesome Jane! Spread the word about healthy vegan food! i just stumbled across this and i cannot believe you married two of my favorite things! tempeh reubens? pasta? i just died. Right on, Midwestvaygun! I hope that I can continue to rock your socks. Thanks for the great recipe. I have gluten issues but may try the rye pasta as rye tends to be lower in gluten and I miss pasta so much. There is semolina flour in the pasta that I made which does contain gluten :-(. I haven’t experimented with gluten-free pastas but perhaps I should. this looks…..pretty good!!!! make me some!!!! I’d love to make this for you. I miss you and can’t wait to see you in September.